A fairly common strategy for regional and community banks is to offer variable rate funding to their commercial clients and simultaneously arrange an interest rate swap to affect a synthetic fixed rate loan. Typically, these banks also arrange coincident, offsetting swaps with independent derivatives dealers. In this way, the banks are able to add to their bottom line without introducing any duration risk to their overall portfolio, while at the same time satisfying their customer’s funding preferences. For the trade to be reasonable and appropriate, the strategy would have to compensate the bank appropriately for bearing the counterparty credit risk associated with the swaps. The strategy is commonly known as a back-to-back swap strategy. We assume the transaction is driven by the customer’s desire for term funding, while the bank prefers variable funding. Interest rate swaps can serve to allow both parties to satisfy their respective objectives. Moreover, the swaps can be engineered to generate an up-front cash flow to the benefit of the bank in an amount that serves to accelerate earnings that the bank realizes. This process will be demonstrated by the example. Note the equivalency of the principal and notional amounts, the fact that all start and end dates are in common, and the reliance on the same variable interest rate benchmark for the various components of the trade. The bank effectively trades the two swaps simultaneously. We start with the consideration of the two, respective at-market swaps – i.e., swaps that have a starting value of zero, where the fixed rates are determined in a manner that reflects the credit quality of the counterparties to the contract. For the purposes of the example, we assume that the at-market fixed rate for the bank/dealer swap is 0.75%, and the at-market fixed rate on the customer/bank swap is 40 basis points higher, or 1.15%. As a practical matter, the bank will generally dictate the fixed rate on the customer/bank swap. Appreciating that the credit risk associated with lending to the customer is (or should) be reflected in the spread over LIBOR that’s specified by the loan agreement, the assumed 40 basis point differential between the two fixed rates in this example represents the compensation that the bank would require in connection with the incremental credit risk associated with fixed rate funding versus floating rate funding. The higher fixed rate on the customer/bank swap (relative to the bank/dealer swap is also justified given that the bank customer would likely have an inferior credit rating relative the bank. On that basis, the fixed rate that the customer pays on a pay fixed/receive variable swap should be higher than the fixed rate that the bank would pay on a similarly constructed swap. In any case, baring default, the bank would end up earning this difference between these two fixed interest rates through the term of the swaps. An alternative structure allows the bank to accelerate earnings recognition under this strategy by altering the terms of the bank/dealer swap. Specifically, the fixed rate on the bank/dealer swap could be adjusted upward from 0.75% to the same 1.15% rate that applies to the other swap, with a compensating day-one cash flow paid by the dealer to the bank in an amount that reflects the present value of the incrementally higher fixed interest payment that the dealer would receive. For the purposed of the example, we assume that present value effect to be $34,000. The accounting for this strategy requires both swaps to be recorded on the balance sheet by the bank at their respective fair market values, with changes in values posted to earnings. The earnings effect includes swap settlements, as well as these mark-to-market adjustments. Note that because total swap results (mark-to-market changes plus settlements) are reported in earnings, swap accruals need not be specifically identified or independently accounted for. In fact, any explicit journal entries relating to swap accrual would foster a double counting if the total swaps’ results are otherwise correctly recorded. Recall that at the time of the trade, the customer/bank swap is transacted with no initial net investment (i.e., no day-one settlement), such that no journal entry arises for that transaction on the trade date. 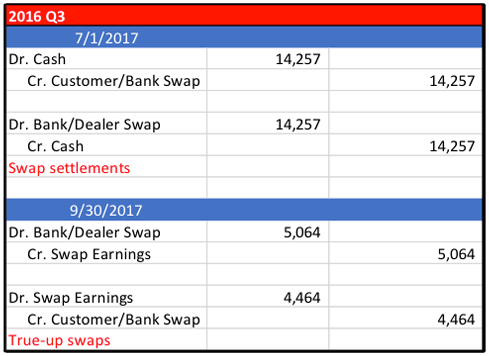 On the other hand, a day-one settlement does occur from dealer to the bank for having marked up the fixed leg of their swap to mirror the customer/bank swap’s fixed rate. When the dealer makes a day-one settlement (typically paid T+2) to the bank, the correct journal entry is a debit of cash and a credit to the derivative account in the amount of the settlement. Our example assumes a day-one settlement of $34,000 (equal to the present value of the incremental 40 basis points). 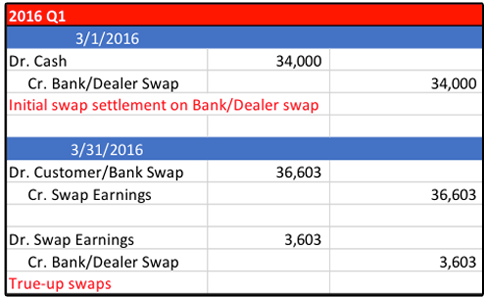 Thus, with the receipt of the cash, the bank/dealer swap is a liability worth $34,000 from the perspective of the bank and an asset of the same value from the perspective of the dealer. Following this initial settlement, both swaps would be marked-to-market through income. From the bank’s perspective, one of the swaps would be an asset; the other a liability. Differences will arise as a consequence of credit considerations. That is, the derivative carrying values on the balance sheet must reflect credit qualities of the counterparties. Different counterparties will serve to generate different valuations, and these valuation discrepancies will foster earnings effect through the transaction horizons. In any case, though, these ongoing earnings impacts notwithstanding, the aggregate realized earnings will sum precisely to the value of the day-one settlement amount. The prospective income volatility of this strategy could be avoided if both of the swaps were fully collateralized, with daily variation margin adjustments. In that situation, typical valuation conventions would price the two swaps identically with no credit adjustments, thus obviating the income volatility after the first accounting period. Typically, however, commercial borrowers are generally not subject to such daily variation margin requirements, and it’s likely that these customers would be resistant to accommodating to such margining practices. The following table contains the required data needed to generate all the associated journal entries for the back-to-back swaps. It presumes that the two respective valuations differ in each period due to the different credit qualities of the counterparty pairs for the respective swaps. 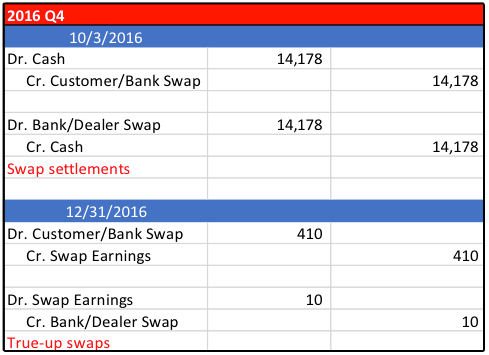 The respective earnings of each of these swaps, period by period, is the combined effects of changes in swap values plus (or minus) any settlements received (or paid) subsequent to the initial trade date. Swap accrual amounts are fully reflected in the swaps’ fair values and hence the change in fair values, so no other explicit accrual adjustments are necessary or appropriate. Put another way, with the accrual amounts reflected in the carrying value calculations, the impact of the settlements is explicitly realized in the reporting interval in which those settlements occur. As stated above, the Combined Earnings is the sum of both Total Swap Results, which, in this example grosses up to an aggregate earnings of $34,000 over the full term of the strategy (i.e., $33,000 – $100 + $600 +$400 + $100 = $34,000) – an amount that is identical to the initial settlement on the Bank/Dealer Swap. Critically, by engineering of the bank/dealer swap to provide for an initial day-one cash flow to the benefit of the bank, the bank is able to accelerate the earnings recognition under the strategy, realizing the lion’s share of this earnings in the first reporting period (ending 3/31/16, in this example). After that first period, some earnings volatility arises, again, as a consequence of the differences in the two swap valuations due to credit considerations. Objectives, strategies, and magnitudes relevant for using derivatives, whether for hedging or for speculation, must be disclosed. Additional disclosures are also mandated when hedge relations apply (815-10-50, 815-25-45, 815-25-50, and 815-30-45). Do You Think Like Your Competition? Is there a sentiment extreme in the euro as the Fed looms?